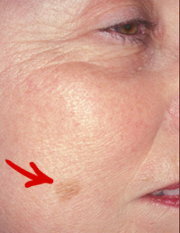 Age spots on the face usually take the appearance of darker pigmented areas of various sizes and shapes. Age spots are usually brownish in color and whilst they often occur on the face, may also appear on the hands, neck, chest and other visible areas. These sort of spots are usually the result of decades of exposure to the sun, and may also technically be known as ‘solar lentigines’. Who Is Most at Risk of Developing Age Spots? People who have spent many years out in the sun, with little to no sun protection, are generally most at risk of having age spots appear later in life. People aged 40 years and over are most likely to start noticing age spots, but younger people may also be affected. Whilst age spots do not pose a health risk, they can be distressing, particularly when located on the face. If an age spot is suspected of being something more sinister, then a dermatologist should be consulted in order to rule out a possible skin cancer. How Can You Prevent Age Spots? If you have noticed that the older people in your family suffer from age spots, and you’d like to avoid the same fate, then what measures can you take? Maintaining sun protection should be a top priority, and this is easy to do by simply wearing sunscreen, and by staying out of direct sunlight in the hottest parts of the middle of the day. These actions will also considerably help your skin to stay youthful and healthy for longer as you age. What are the Treatment Options for Facial Age Spots? Dermatologists will often prescribe a prescription medications or a cream to treat age spots. For example, retinol is commonly prescribed as it is believed to work quicker than many formulas that are found over the counter. Some people will experience unwanted side effects however, and it is always advisable to undertake research before starting any prescription product, in order to decide whether the possible benefits are worth the risk. Whilst there are no shortage of cosmetic creams and other topical products out there that claim to be a cure all solution for facial age spots, whether any of them actually work as they claim is a matter to consider. Another procedure that many people attempt at home is called a hydroquinone preparation, or HQ. However this option is generally not recognized as an effective treatment specifically for age spots. One other option that people have seen success with however, is a product called Meladerm. This is an all natural topical treatment that does not use any of the harsh chemicals and ingredients found in so many other products. It is worth a look if you wish to treat your age spots using a more natural approach. There are also a number of other procedures that some dermatologists now use in an attempt to treat age spots, particularly those that are severe and are causing significant distress to the person. These treatments may include chemical peels, microdermabrasion and laser therapy. These procedures generally have the aim of lightening the age spots and thus, reducing their appearance, but not necessarily eliminating them altogether. Many of these therapy options require multiple treatments, and can cost a surprisingly high amount, as health insurance will often not cover what is considered be an optional cosmetic procedure. Are There Any Foods That Can Help Reduce Age Spot Appearance? Eating a wide variety of vitamin and mineral rich foods will certainly go a long way to improving the overall appearance of your skin. Whilst it generally won’t result in a complete disappearance of your age spots, if your skin is healthy then you will feel considerably more confident. Foods like leafy green vegetables, broccoli, Vitamin C rich fruits and vegetables, and foods that are high in the all important Omega-3 fatty acid, are all worth including more of in your diet on a daily basis. Knowing what causes age spots and what options you have for the treatment of them will allow you to realize that this problem does not have to be a permanent one. Certainly, thousands of people have successfully gotten rid of their age spots without resorting to some of the more harsh and expensive treatment options. Your dermatologist will be able to advise on the best course of treatment for your particular situation; however it is always worthwhile to research alternative options and to find out if they are helping real people like you to improve their skin by reducing the appearance of age spots. Remember, if your age spots are changing shape and color, are getting larger, or becoming irritated and itchy, you should always see your doctor in order to rule out a more serious condition.